The Angriest: Star Trek: Voyager: "Parturition"
It is 9 October 1995, and time for another episode of Star Trek: Voyager. 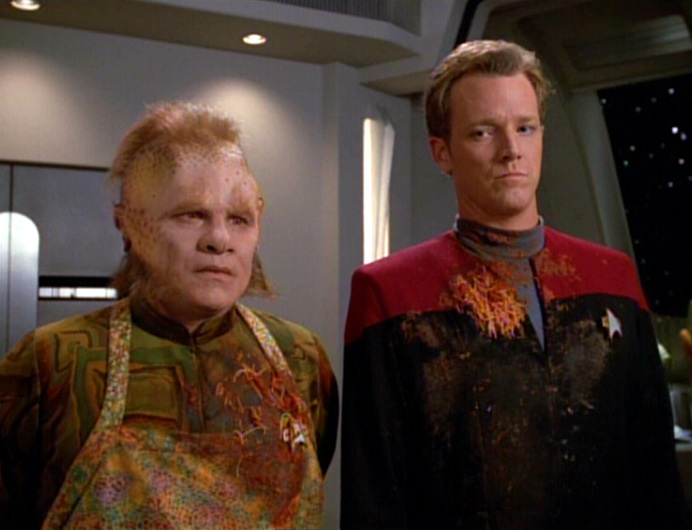 With Voyager rapidly running out of food stocks, Captain Janeway (Kate Mulgrew) dispatches Paris (Robert Duncan McNeill) and Neelix (Ethan Phillips) down to the surface of the inhospitable "Planet Hell" in search of supplies. With Neelix fuming with jealousy at Paris appearing to woo Kes (Jennifer Lien) away from him, the biggest risk may not be on the planet's surface but rather between the two men. If there is a single element of Voyager that has grated more than any other during its first season-and-a-half, it is Neelix's continuing jealousy at Kes spending time with Paris. It is a tedious character element: one that doesn't just feel rote and hollow, but also one that actively weakens Neelix as a character. It makes him unlikeable. It makes him petty. Given that Ethan Phillips is already working from behind the eight-ball with Neelix's other numerous character shortfalls, it renders the job of making him a likeable and entertaining character almost impossible. With "Parturition", the writing team finally attempt to remove the jealousy problem for good. On the one hand that's a good thing, since it's a problem that definitely needed removing. On the other hand, it means wallowing in the problem for an entire hour before removing it, and I am honestly not sure if that was the smartest move imaginable. Better to drop it and move on than to actively point it out to viewers. It's an odd sort of an episode. McNeill and Phillips spark off a solid on-screen chemistry, and they get a few genuinely funny lines to throw back and forth at one another. Once they crash-land on the so-called "Planet Hell" (an in-joke to what the Star Trek production team called their standing rocky alien planet set), they soon find themselves caring for an alien baby in an overtly comical - and it has to be said, rather outdated - fashion. There's not a great deal else here. An alien starship arrives to collect the baby, which admittedly brings to the series one of the most unintentionally funny looking aliens Voyager has enjoyed so far, but outside of that it's a fairly simple and slow state of affairs. Is it bad? Probably not. Is it actually worth recommending, or watching? Again, probably not. With two good episodes out of seven, the Voyager quality ratio slips to 29 per cent.